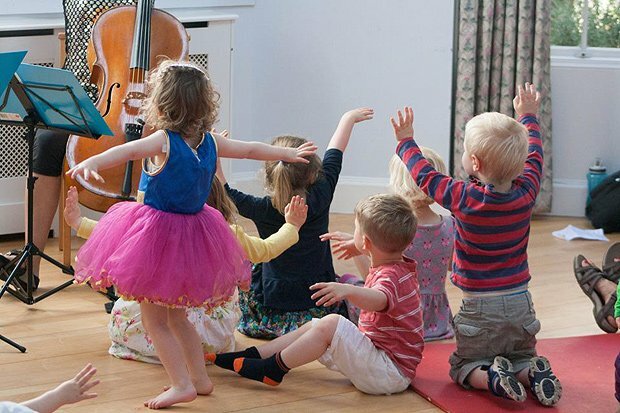 Part of the cleverness of these recitals, two short programmes of classical music specially designed for babies and toddlers, is their pared-back setting; the sort of church hall that almost every preschooler (and their parent) already knows from toddler club or playgroup. That familiarity ensures that the audience feels comfortable – and free to roam the space – even before the concert starts. Toddlers can get as close as they like to cellist Clea Friend and violinist Louise Bevan to investigate how these lovely noises are being made (as long as they don't try and steal the sheet music), while the half-hour run time is perfectly pitched for tiny attention spans. Wriggle Around The World is the second concert of the day (after King Arthur), with a brilliantly diverse programme that never patronises its very young audience. Using just violin and cello, Friend and Bevan take us on a journey through global musical styles – traditional Japanese doll-song, Hungarian folk dance, Louisiana-inspired bluegrass, and a jaunty piece specially created for the Wrigglers by South African composer Eugene Skeef. The children pull startled faces and flap excitedly at the variety of sounds, eventually spiralling out around the hall in joyous, wild dance interpretations. It's utterly beautiful. Stockbridge Parish Church, until 26 Aug, 10.30am, family ticket £6. Recitals for Wrigglers An educational, interactive and light-hearted classical music experience for all the family. Come and hear a violin and cello close up in a concert where wriggling is allowed. Sell-out shows 2015 and 2016. There will be music from other countries with themes of travel.